1 of 4 Place onion, oil, lime juice, garlic, scallion, salt, allspice, thyme, nutmeg, cinnamon, pepper and hot sauce in a blender. Whirl until smooth. 2 of 4 Place pork chops in a large resealable plastic bag; add marinade. Seal and marinate in the refrigerator for 2 hours. Turn occasionally to be sure all meat is coated with the marinade. Add shrimp during the last half hour; seal and turn to coat thoroughly. 3 of 4 Heat a gas grill to medium-high or prepare a charcoal grill with medium-hot coals. Lightly coat grill rack with oil or nonstick cooking spray. 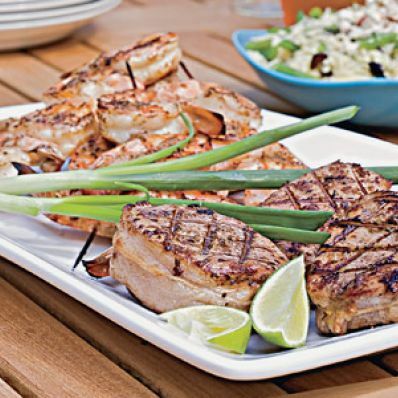 4 of 4 Remove pork chops and shrimp from plastic bag and shake off excess marinade; discard marinade. Tie each chop with cooking twine so it maintains a round shape to cook evenly. Grill for 5 minutes per side or until internal temperature reaches 160 degrees F on an instant-read thermometer. Grill shrimp for 2 to 3 minutes per side until cooked through. Nutrition Information for Jerk-Seasoned "Surf & Turf"
Per Serving: 553 mg sodium, 42 g pro., 302 kcal cal., 1 g fiber, 12 g Fat, total, 4 g carb., 3 g sat. fat, 179 mg chol.